120 episodes ago, we had what we call the Golden Episode: e024 Finding Clients While Maintaining Professionalism. 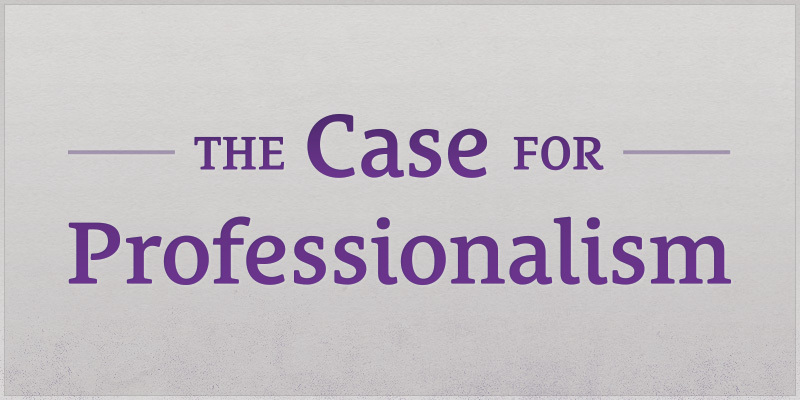 It’s time to revisit the topic of professionalism and lay a solid foundation. You may have heard me talk about my upcoming course at ValueBasedPricing.com. Up next on the podcast, I’ll also be doing a multi-part Value-Based Pricing series where I teach you how to price on value. However, you can’t just start pricing on value immediately. You need to lay the groundwork of professionalism first. You’ve heard me touch on professionalism a lot in the podcast, but this will be an exhaustive breakdown on how to set yourself apart by working like a pro. You’ll hear how to attract clients instead of chasing them, establishing your process, filtering with your questionnaire, setting expectations, invoicing, presentation, and a lot more. 04:40 Sean: Why hire a pro? Why does it even matter? Shouldn’t you just look for the cheapest price and save money? 04:59 Aaron: When you really care about what you’re making and you want it to be great, you need to find someone who is good at helping you achieve your goals. It’s often more efficient to hire someone rather than take the time to learn it yourself. It’s an investment. 05:29 Ben: I like that word—investment. There’s a difference between seeing something as an expense vs. an investment. An example is the organic, whole food I buy. I don’t see the grocery bill as an expense in my budget but rather a long-term investment in my health. You can survive on junk food but whole food is going to help your body function better over all. In the same way, professionals don’t just come in and solve one problem, they help uncover the deeper problems for a company. 06:53 Sean: I agree. A professional places themselves in the investment category. They’re not trying to compete on price and race to the bottom with everyone else to become a commodity. Professionals are about the client’s success. Rather than saying, “I can get you the cheapest price,” professionals say, “Invest in yourself by investing in my services.” Pricing on how long a project takes or on market rates is a race to the bottom. It becomes focused on the person doing the work. Professionals focus on the client’s benefit and success. You set yourself apart in the way you act, communicate, and price yourself because you have something more to offer. 08:12 Ben: I remember when I first got started with web design, I would look at other designers websites in search of how to communicate with clients. When I asked myself, “What would add the most value for the client?” I arrived at the same conclusions that we’ve talked about in this podcast. For someone who’s new to a profession, don’t base what you’re doing off of the unhealthy conventions that exist in large quantity out there. 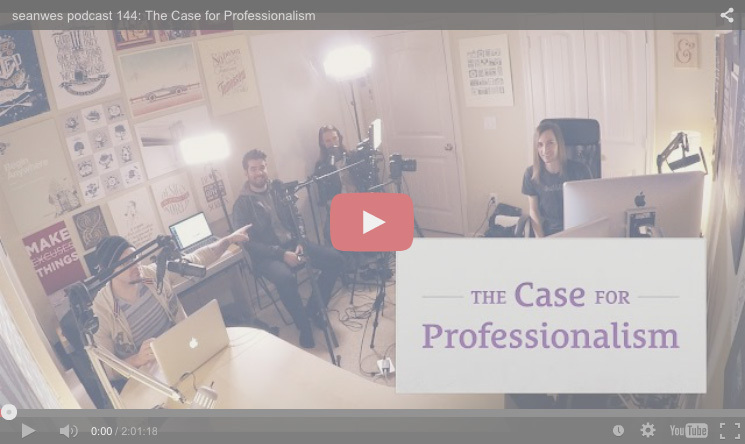 09:34 Sean: To distill down the answer to the question, “Why professionalism?” it’s that professionalism is about the client’s success, while someone who isn’t a professional—such as a technician—isn’t concerned about the client’s benefit. It’s worth investing in a professional. If you’re wanting to position yourself as a professional, the first thing you need to do is build trust. The client needs to have full trust in you if they’re going to allow you to take control in the areas you have expertise. That trust doesn’t happen instantly, it happens over time. People may be aware of you for months or years before they even hire you. This isn’t a quick-gain thing, you need to establish yourself. 10:46 Think of any professional you want to hire—like a doctor. You want someone who’s established, been in practice for a while, and has shown they’re capable. What establishes you as trustworthy in the client’s eyes? We talk about this in the context of design but it applies to other industries as well. In this context, I’m also not talking about whether or not you’re going to lie to me, I’m talking about your capabilities. 11:35 Ben: The word investment comes with the idea of risk. When you position yourself as an expense, clients will expect to get exactly what they paid for. They will want their hands in the creative process. When you’re making an investment, you’re really taking on a risk. The more you instill trust, the lower the risk is for the client and the more willing they are to take on that risk. 12:33 Sean: It’s trust as it pertains to expertise. How does someone know their project is in capable hands? Track record. What establishes track records? Doing both of the above consistently. 12:54 Sure, having a nice website and thorough questionnaire makes a good impression and shows you’re serious, but those aren’t the same as case studies and writing. Case studies demonstrate you know what you’re doing. It’s not just a grid of images—clips from past projects—it’s explaining the problems you’ve solved. Case studies tell a story potential clients can see themselves in. 13:32 Ben: If a client goes to your website and sees you have case studies, without even reading them, you’re already set apart from thousands of other designers. 14:19 Aaron: In my experience, if a client contacts me and immediately wants to talk about money—that’s a red flag. If your initial conversation is about goals and you’ve already proven you can solve problems, you should talk about the problem, how you can help, and eventually have a conversation about money. The clients that come to me and say, “Here’s my problem and I’ve got $50,” aren’t utilizing me as a professional to help them with their overall goals. They’re trying to throw money at a problem to make it go away. When a client comes to you only focused on money, they see you as an expense. Expenses are things you try to keep down and investments are things you try to maximize. 15:23 Sean: If you have a budget field at the top of your questionnaire, it’s going to be at the top of the client’s mind. If you don’t have the budget field at the top, or you acknowledge the absence of it, you may be able to solve a problem they didn’t expect or didn’t realize was relevant. Next thing you know, it has a huge impact on their bottom line. 16:31 They may go into a project thinking they know the problem they want to solve and they can throw $1,000 at you to do it. But if you ask the right questions, you could solve the problem in such a way that could make a $100,000 difference in their bottom line. Why wouldn’t they pay $20,000 to realize $100,000 worth of value that wouldn’t have been there without your help? You just turned something that would have been $1,000 in a budget field into a $10,000-$30,000 project that benefits them even more. 17:12 Ben: Through focusing on goals, if you realized the solution you have isn’t right for them at the moment and you directed them to someone who can solve the particular problem they have, think about how powerful that would be. They would remember you because you weren’t the person who just took their money, you helped them understand what their problems and goals really were. 18:02 Sean: A personal example would be building the new chat system in the Community. I had no idea what it would cost—the ball park in my mind was $20,000. Justin Michael, my developer, made our iOS app and that was essentially a case study for me. He did a really good job! He showed me problems he solved that I didn’t even ask for and he solved them in ways I wouldn’t have even thought of. He focused the conversation on problems to solve and he was able to solve them in an intuitive way. I wanted to invest in him building the new chat system, so when he came back with a $50,000 quote, I had to think about it for a few days but then it was a no-brainer. 19:36 It may have been most of the money I had saved for future things and I may not see revenue from the investment through Community memberships for a couple of years, but I wanted to invest in making a great experience for the members. Justin will actually be collaborating with me on the Value-Based Pricing course. If you want to be able to make a difference with a client—even double your rates—this course will help you get there. To the people thinking, “What clients are going to pay more?” Not the ones you’re attracting when you focus on money. You aren’t going to know what that’s like until you start thinking differently. You won’t start attracting those clients until you shift the way you position yourself. 20:51 Aaron: I’ve struggled with this personally in my business. The thing I had to realize is just because I only have $100 in my bank account, doesn’t mean that people I’m going to work with only have $100 in their bank account. That’s Scarcity Mindset saying, “I want to charge $2,000 for this project, and $2,000 is a lot of money for me right now!” But guess what? There are people out there with millions of dollars. 21:26 Ben: It would almost be an insult to give a $2,000 quote to someone like that because to them, it could be worth a $100,000 investment. 21:40 Sean: That’s absolutely true. When I had the web firm, we gave a $20,000 proposal to a department at MIT for a section of their website and we weren’t even considered because everyone else they had solicited gave quotes many times over what we quoted. They immediately dismissed us. 22:09 Ben: When we think about those “larger” clients, we tend to think they’re out of our league. But if you’re focused on solving problems, you might be exactly what they need. That perceived difference between how professional you are and the size of the client you can handle goes away when you focus on the problems. To Sarah’s question, “Where are the clients who are ready to invest in quality?”—there’s a fear there aren’t many clients like that out there. The reality is there are clients out there and you may not be seeing them because you’re not positioning yourself as a professional. 23:39 Sean: When you chase clients, you chase the ones that are the type you don’t want. When you attract clients, you attract the ones you do want. The ones you chase are the ones who don’t care about problems. The ones that come to you are coming to you for your expertise. The point here is to attract clients and not chase them. Build up a body of work that speaks for itself. It makes all the difference in the world when you have a body of work that attracts clients to you as opposed to you chasing clients. 24:32 This is absolutely key in getting the kind of clients you want (Related: tv033 How Do I Know When I’m Skilled Enough to Start Making Money?). When a client approaches you, they are in a deferential position. They are more willing to come under your process. When you’re chasing them and cold-calling them, you look desperate. Because of the Rule of Reciprocity, you’re now seen as asking them for the favor of being your client. 25:11 When you’re going to them asking for their business, you’re putting yourself in debt to them. They will then be more inclined to fight you on your process and ask for more from you because you, essentially, owe them for the favor of becoming your client. When you are the one who displays the work and expertise, it attracts clients to you. You don’t see them because you’re not attracting them—you’re too busy chasing them. When they are the ones approaching you, it sets the relationship off on the right foot. 27:33 Your general process is an overview of how you work, which should be displayed on your website publicly. Case studies are an adaptation of your general process because it shows people how you work in a given situation. They should see your general process before they even contact you. Once you begin work with a client, you provide them with a project-specific process so they know how it will look for them. A project-specific process is your general process that’s been tailored to a specific client. 28:31 Ben: I remember when we first started talking about processes and you said, “You don’t have a process unless you have it written down.” In the same way, your client can’t know anything about your process unless it’s visible to them. Give it prominence on your website. Your general process should be the first thing clients experience with you before they even contact you. 29:24 Sean: Absolutely. A lot of people wonder, “How do I come up with a process?” If you’ve done work before, you need to take inventory of what you did and in what order. Start with writing it down and if you have trouble recalling the details of your last project, start with your next one. As you’re doing things, make a list. You now have bullet points you can expand upon. You feel like you don’t have a process because you haven’t written it down. 30:47 Ben: Bonus: as you write down your process you can examine how efficient your process is. You can provide even more value because your process gets refined from client to client. 31:16 Sean: Wowter, in the chat room, said he used Early Wake Daily Write to write his process. Great idea! Ben Flack asks, “If I’m doing pro-bono work to build my portfolio, is it ok not to have a process yet and use those projects to define it?” Yes. At some point you have to do something, refine, and iterate as you go. If you haven’t done work before, that’s a great way to establish a process—take inventory of what you’re doing on a pro-bono project. 32:05 Aaron: Read some client studies from professionals. 32:07 Ben: You might find some practices you want to use from reading other professionals’ case studies. 32:18 Sean: I like that answer because it goes along with the advice I recently gave Cory about writing proposals for the first time (Related: tv046 Working With Friends As Clients). Going through the process with someone who has done it before allowed him to prepare for it even though it was his first time. I was saying you have to dive in at some point but it’s great to glean from someone who’s done what you’re about to do. You can borrow some ideas from them to get your first process out and iterate on top of that. 33:06 Someone else in the chat asks, “What if your clients don’t have millions of dollars because they aren’t big businesses, but they’re a one-man business or a wedding couple? Don’t they deserve a professional?” and Aaron’s response to this was, “If you spend your life working for poor people, expect to stay poor.” It’s harsh and it’s absolutely true—it’s logic! If you’re not solving problems for people who have money to throw at those problems, you can’t expect to make money. It doesn’t matter if you build a great solution for someone if they can’t pay for it. I liked Ben Flack’s follow up to this, “Concentrate on attracting high-value clients first, then you can use your freedom to benefit the low-dollar clients too.” I love that approach. 34:28 Ben: I want there to be a distinction between working with a client as a professional and working with a client who can pay you a lot of money—there’s a big difference. If you’re going to target lower-dollar clients—like the nonprofit sector—you need to overlap into that. If you’re going to work with them and still be able to support yourself, it’s a choice you have to make. It doesn’t mean you shouldn’t be professional with those clients because they don’t have a lot of money to spend. If you choose to go into that kind of work, you should make sure you’re able to provide full value because you’ve covered your bills in other ways. 35:37 Sean: That’s how you do Relationship Marketing, podcasts without sponsors, and a free daily video show—overlap. You get your bills covered first and afford yourself the freedom to take on things that may not be as profitable in terms of short-term gains. 36:04 Aaron: I recently watched a TED talk by Aaron Draplin where he described his plan for Free Fridays. He’ll take on pro-bono work and work on those projects on Fridays. His mentality is to work with people he wants to work with regardless of whether they can pay him or not. It worked out for him because some people paid him in the form of a burrito and some people could pay $25,000 for a logo. I don’t want to say that not making money is bad. Helping someone is a great goal but if you need money to pay your bills so you can reach the next stage of your career, you need to focus on doing things you can charge money for. To do that, you need to work for people who can afford to pay you what you’re worth. 37:15 Sean: If anyone is considering doing that, I would recommend you don’t go advertising the fact that you do free logos. That undermines your professionalism with your paying clients on the remaining 4 days. You can give away what you want on your own time. 38:11 The advice of “Don’t chase clients, attract them,” applies to free clients as well. You should have two prices: full-price or free (Related: e064 Two Prices: Full Price & Free). If you tell someone what it costs and they can’t afford it, you then have the option of doing it pro-bono. The good thing about this is they came to you. They see you as a professional and they are coming under your process. Even if you do the work pro-bono, you still have a case study. You don’t have to say you did it for free in the case study. It still shows your future clients you know what you’re doing. If you chase clients, even to do free work for them, they won’t be inclined to come under your professional process. 39:50 Ben: If there’s an organization I love and I want to help them out, but they may not think to reach out to a professional designer because they know they don’t have the funds, is there an allowance for me to reach out to them? 40:44 Aaron: Unless you’re doing really well with your paying clients, I don’t think it’s something you should invest time in. 40:56 Sean: As long as you’re not in Scarcity Mindset. 41:00 Ben: Assume you have your bills covered, you have the time, and you have the desire to devote to projects like this. People not seeing you as a professional. People feeling like you owe them. People not being willing to come under your process. 41:59 Ben: It feels like a chicken and egg situation. We’re saying if you want to attract the right kind of client, write a lot of case studies, but at the same time if you want to do pro-bono work, you don’t approach the client because you should let the client come to you. 42:21 Sean: If you start with personal projects, you will get people coming to you. If you’re in a place where you need to chase clients, you’re not overlapping. It means you don’t have your bills covered and you’re thinking in terms of scarcity. Don’t worry about chasing them, worry about attracting them and set yourself up to be able to do that. 43:05 Aaron: Levi, in the chat room, asked, “Is there a professional way to approach clients that would benefit from what you have to offer without them approaching you?” They may not be aware they need help. I come across this a lot because I edit podcasts. If you identify an issue someone is having—like if I come across a podcast that has a lot of background noise—you could reach out and mention you can help them. If I really love a show and I want to help them, I’ll send an email. You could also write about the solution to that problem on your website. You don’t even have to send the blog link to them. Over time, if someone is searching for that solution, more than likely Google will point them to your site. 44:26 Sean: If you observe a problem, you could write about it on your blog so that it would help a bunch of people and you can point that person to it. That’s how I ended up hiring Justin to develop the IOS app. He took initiative and wrote up a step by step process on how to take the existing chat and make it a stand-alone application for Mac. 45:09 Ben: He didn’t even reach out to you in that case, he just wrote it. That does step around the Rule of Reciprocity. If you go to a client asking for their business, then you owe them something because they’ve given you their time and attention. Whereas, if you approach them by giving them something of value, it’s the other way around. 45:41 Sean: If they ask you, it’s because you gave them something. You’re using the Rule of Reciprocity in your favor. 46:29 Once you’ve got your general process on your website, the next thing you want to do is filter with your questionnaire. You ask the client questions so you know what they’re trying to do with their project. You might be wondering what I mean by filter. Asking the right questions helps keep the wrong clients out. 45:51 For instance: not asking for a budget goes towards not positioning yourself as an expense. It helps frame the client’s mindset around solving problems. Having the right questions is important. A lot of people just have a name field, email field, and a message field, but this will open the flood gates. If you’re in Scarcity Mindset you might think you should take what you can get but you don’t want to take on whatever you can get. You want to take on the right clients and the right clients are the ones that are serious about their project. By having a questionnaire up with fields for an organization name, what the organization does, why it matters, and who their target audience is, you’ll know when someone is serious about their project by their answers. 48:02 Ben: A questionnaire is a form of communication. It’s one of the ways you get to tell the client a story about who you are, what’s important to you, and how you work. It’s not just the questions you ask, it’s the wording and the order of those questions. Sometimes we make the mistake of thinking the on-boarding process isn’t significant but every single interaction you have with the client—whether directly or through the questionnaire—is important and can speak to who you are. 48:50 Sean: It’s the questions you’re asking and the questions you’re not asking that speak about you. Filter with your questionnaire and make sure you’re asking questions in order to allow the client to reach you. Don’t make the questionnaire so open that you get everything. That’s just time you’ll have to spend wading through requests that you don’t want to work with. Once the client has filled out the questionnaire and you’ve got the request, determine if they have problems you can solve and start the preliminary discussion. 50:23 Talk with them about your project-specific process. Give a description of what the process will look like for their project and what you’ll be doing to solve their problems. Don’t condense everything into one steps by sending the proposal and invoice all at once. You can’t expect them to read through everything thoroughly that way. You have to guide them through the process. Be patience and build a rapport with them. See how they respond to your project-specific process. If they respond with demands and they want to change the project-specific process, you may want to reframe that conversation or consider not working with them (Related: e111 Courting Your Clients and Customers). 52:24 You should vet their response to the preliminary discussion. If it seems like they’re on board, you follow up with the proposal and agreement. The key to this part is not to just send over a PDF of legal jargon. You shouldn’t put that burden on the client. You need to take a two-fold approach: give them your agreement, then reiterate those terms in plain english—on the phone, by email, or in person. Talk with them about what the terms mean. Explain when you’ll start the project, what needs to be paid up front, how long the project will last, what you won’t be doing, and what they can expect from you after the final invoice is paid. 53:26 With this two fold process, you’re including the contractual part of the agreement but you’re also being human and telling them personally how the process will work. A lot of people will send an agreement and not explain it personally, then in the middle of the project, issues arise. You end up thumping the contract at the client and that’s bad! That will only cause stress and friction. You never want to go to the contract unless there’s legal stuff to do deal with. 54:17 Ben: If you’re concerned a potential client might have an issue with your contract at some point during the project and you don’t want to have that conversation with them, the reality is the issue will come up some time. Wouldn’t you rather it happen early on before you’ve reached the middle of the project and it becomes a big mess? 54:53 Sean: Jean, in the chat room, asks, “If you get a response to your questionnaire and it’s obvious they aren’t ready, do you respond or just ignore their inquiry?” It really depends on the volume of requests you’re getting but if you ask a lot of questions, that’s going to limit the number of requests you get, which means you can afford to respond to each of them. They may come back to you when they’re ready. I would come up with a boiler plate response that says something along the lines of, “Thanks so much for your interest and I’m glad you got in touch. Due to the volume of requests I get, I’m highly selective with the projects I’m taking on so I’ll need to pass on the project at this time. All the best.” Make it nice and polite. If you’re getting too many requests and you’re not absurdly popular, you may want to consider getting more specific in your questionnaire to filter out the wrong people. Ask yourself: what are the characteristics of the wrong clients and how can I filter them out with a question up front? 56:15 During the preliminary discussions, you want to establish responsibilities. You should iterate this in your general process and your case studies. You can’t just say something to someone once and expect them to remember, and then get mad when they don’t. You need to tell them multiple times what they’re responsible for, what you’re responsible for, and what you’re not responsible for. Be very clear. In the case of design, clients are responsible for 2 things: content and goals. Design is your area of expertise. The client has input up front and you should defer to them since they’re the expert in their domain. Get all the information you need and then you act out your responsibilities with your expertise. If you’re allowing the client to make design decisions, then you’re not being professional. 57:45 Aaron: Someone in the chat room earlier was asking about getting paid up front to figure out if you’re the right solution to the client’s problem—like a discovery process. 57:58 Ben: That could be another good filter too. 58:02 Sean: It is. If you’re getting a lot of the right type of requests and you simply don’t have the capacity, or you’re spending a lot of time in preliminary discussions giving value but you’re not getting compensated for it because they leave or you’re not quoting enough, it’s not wrong to charge for that. If you’re helping them figure out what problems to solve and how the project should be laid out, they could take that to another firm, contractor, or agency. That’s value you gave away. It makes sense to invest that in a client when you’re about to work with them but it’s not unreasonable to charge for that upfront as an initial consultation if you can afford to. 59:03 Send the proposal and agreement, reiterate the process and terms by having a personal conversation, then comes invoicing. It seems simple but a lot of people don’t get this. Professionals are paid for their work, they don’t just do the work and hope the client pays the invoice eventually. You’re paid up front to start working and then you’re paid before the deliverables. You send the invoice and the project doesn’t start until you’re paid. We’ve talked about this before with clients saying they’ll pay in 90 days. You set those terms, you’re the professional. If you don’t want to wait 90 days to get paid, define it it in your contract. You can work with a Net 90 client and have them pay you sooner because I’ve done it. The way you do that is you attract clients to you. If you’re chasing clients, you have no leverage. If you’re attracting clients, then they want to work with you for a reason and you have leverage. 1:00:40 Ben: If you have a potential client that can pay the full value but they can only pay a certain amount per week or per month because of their budget, what would you say to that? I’m thinking if you filter right, you don’t even get to that conversation. I might tell them to save up for however many months it will take them to get the total amount and then we can talk again. 1:01:18 Sean: I would take the same approach. It’s the same reason I don’t do payment plans on my courses and won’t on any future courses. I don’t want peoples’ money. I do things to help people and I charge money so I can enable myself to help more people. I’ll give them free material to help them get out of that place even if it effects my bottom line. 1:02:33 Ben: You’ve put yourself in a position to be able to afford to do that. 1:02:46 Sean: I’m not able to do this because I can afford to, I’m able to do this because I chose to do this. Don’t think, “Well, Sean can afford to say no to people and turn down extra money.” I can afford to because I did the Overlap Technique. I got my bills covered. I was able to do this because I made a choice to do it. 1:04:27 You’ve got to get paid first. Trust me, they’ll pay really quick. Problem solved. Worst case is you have the first 50% payment because professionals get paid for their work. 1:04:45 Professionals don’t just send a finished project, they present it. They show the thinking and design process behind it. They explain the decisions made along the way and show how they work to further the client’s goals. Treat this is as you’re going to give a presentation in front of people at a meeting. The beautiful thing about this is, the work you put in to create this case study works double duty—that presentation doubles as your case study. 1:05:49 Ben: That’s an incredible experience for the client. When you walk them through your decision-making process for the project, it gives them little room to object to things—like a color you chose—because you’ve attached your decisions to a goal that they stated. It’s not choosing blue because you think blue looks better, it’s choosing blue because it communicates trust, which is a goal they had set. If you tell the story of how you arrived at those decisions, the client will go there with you. 1:06:57 Sean: It hails back to responsibilities: the client is responsible for content and goals. You’re then taking the goals they gave you in the beginning and showing how you arrived at the solution. It instills so much confidence in the client. It’ll make them feel really good about how they spent their money. 1:07:29 Ben: I’ve noticed that people get so excited about the presentation, they want to adopt that and let others know the story behind the work you did for them. 1:07:48 Sean: That happened with a logo I made for a client. I always showed the guidelines around the logo—not just for white space around the logo, but the measurements and what they’re based off of or what the angle of a custom script is. It’s purposeful but functional. One client I did this for was a DIY engineering type business and they loved it so much, they wanted to use the logo with the guidelines on their business card. They wanted to use the story behind it. You’re not justifying your decisions, you’re showing how it achieves their goals. 1:09:17 Sean: It would be a terrible experience if the client got the final product and had to figure out if it solves their problems. If the professional the client is working with isn’t making objective decisions to solve problems, they will have to justify their decisions instead of showing how it achieves the goals. I didn’t choose blue because it’s my favorite color. I chose it because this was the goal and here’s how blue achieves that goal. You should walk them through how to use it and how the user is going to use it. 1:10:22 Ben: You can’t assume that anything about the end product is self-evident. You’ve got to take the extra step of describing, explaining, and presenting it. 1:10:38 Cory: When you’re presenting it, should you ever say, “I’m really happy with how this turned out?” Maybe it would show pride in the work. 1:11:43 Ben: It’s not pride in the sense that you love the way the final product looks, it’s being proud of it because you understood the client’s goals and you provided a solid solution. 1:11:59 Sean: If you’re happy or proud, channel that into showing the client why you are and why they should also be happy or proud. 1:12:33 Sean: If you’re just starting out (or even if you’re been doing this for awhile) you can leapfrog. Charge a client $1,000 and do what you would consider $3,000 worth of work in value, effort, attention to detail, and quality. That’s going to result in a case study that looks like a $3,000 project. It makes it a lot easier to charge $3,000 for the next project and you can continue to give $6,000 or $8,000 worth of value. That’s how you’ll be able to grow and get higher paying clients. 1:13:10 Aaron: The client will see you solved problems they didn’t even ask you to solve and they’ll tell their friends. Before you know it, you’ll be attracting more clients. 1:13:35 Sean: This all sounds great right? You might be thinking, “I’m a professional! I say how things go and I get paid,” but along with that comes the responsibility of anything that goes wrong. There’s no such thing as clients from hell because only designers from hell take on those type of clients. Everything is the professional’s responsibility. 1:14:14 If there’s a problem, you should have preempted it in your process. Don’t see it as a failure, see it as an opportunity to improve and iterate. Have your eyes open with every project. What can you do better next time? What problems can you solve through prevention next time? A professional seeks and acquires responsibility. They’re looking for what they can take responsibility for in a project. Someone who’s unprofessional will shirk responsibility and shift blame.